In the past, whenever I heard Santa Barbara, California the first thing to come to mind was the truly superior Santa Barbara Olive Company olives. 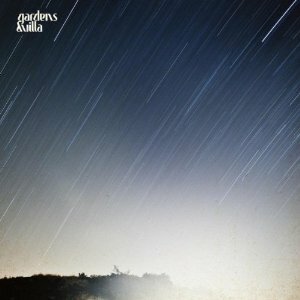 Now, it seems they have competition from the debut self-titled album of Gardens & Villa. The band consists of Chris Lynch, Adam Rasmussen, Shane McKillop, Levi Hayden, Dustin Ineman; they call that-something-special sound of their music “coco vibes” and attributes it to that cool Santa Barbara feeling, dude. They list the genre as galatic fever on their Facebook page, and the tags on Bandcamp include flute folk. Yes, that’s right there is the distinct sound of a flute on “Sunday Morning”, the delicate notes dancing lightly over lyrics contemplating the oft bittersweet happiness in the mundane daily adventures we call life. Galatic fever? Must attribute that to “Spacetime”, an upbeat synth melody, complete with a William Shatneresque voice reiterating “Space… Time!” throughout the song, and starting off a montage of classic Star Trek scenes in my head. The band became official in 2008 and say they have been letting their creativity ferment into a brew that we really want to drink, and that they really wanted to share – and you know what? They were right – I do, I really do like this strange brew of synth, pop, and quiet introspective grooves that sneak in and have a great finish. Label mate Richard Swift not only produced this album, it was recorded in his Oregon studio, the guys deciding to camp out for the duration of the process. Wow. That is some dedication to your craft, along with the assertive stand on recording only what they can play live-no overdubbed backing tracks to mess with the harmony and vibes here, man! Very Talking Heads Stop Making Sense and it makes my mouth water thinking about what they would be like live. They are playing Kanrocksas Music Festival (I swear I didn’t make that up-Kasnas City, Kansas has a music festival. And yes, named it that) in August along with the likes of Muse, The Black Keys, Bassnectar, The Flaming Lips and other fabulous and diverse artists. All those cool breezes of Santa Barbara filtered with a 90s Brit-pop sensibility are creating some mighty fine good vibrations that might require a road trip. I’ll bring the iPod and the beer, who’s with me?